We plant 5 trees through the National Forest Foundation for each ES300 purchased through The Green Sunshine Company’s website. Currently donating to the California Wildfire Restoration Fund. The Electric Sky 300 (ES300) is our flagship wideband LED grow light. It features a spectrum that replicates the “infrared” growth power of the Sun, delivering fast growth and explosive yields from seed to flower. Linear optics focus light for intense grow power and canopy penetration, even at a far distance. And the distributed design allows for close canopy deployment without burning your plants for maximum headroom. 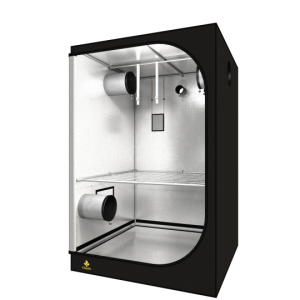 The Electric Sky’s modular design easily adapts from the smallest grow tent to the largest commercial facility. If you’re an “all in” home grower or professional producer who expects quality results and demands a high-yield crop with a blazing fast growing time, then you’re in the right place. When you’re growing your own, you’re looking to get a consistent, high-quality yield grow after grow. And you want lighting that will make it easy to get great results with a healthy and vigorous plant response. After doing your research, you may be confused with all of the different shapes, colors, and sizes of lighting options out there. You may wonder how and if they’ll work for you. You’re not alone with these types of questions, and it’s why we embarked on creating the Electric Sky. 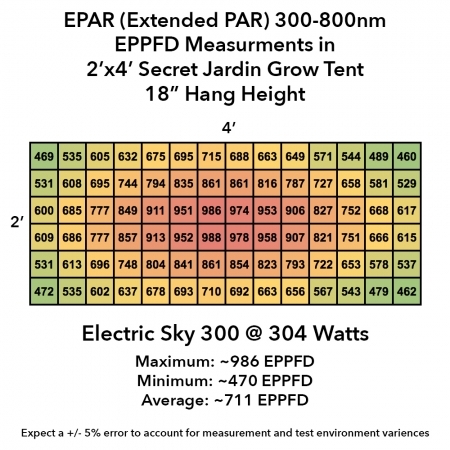 A perplexing part of your findings will uncover that some LED lights will advertise an abnormally large wattage output compared to their actual power rating. Look closely for “true wattage output”, and you’ll see what I mean. What’s worse is that many of these inexpensive LED units are less efficient watt-for-watt than traditional bulb lighting. And in fact, will underperform them. You may have even tried one of these units yourself, and been disappointed with the low quality results. 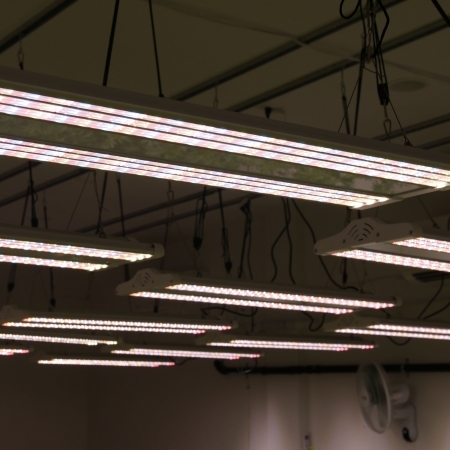 If we can’t be more efficient than standard lighting, or get quality results, then what’s the point of growing with LED? The Electric Sky 300 pulls a true 300 watts from the wall, and its wideband spectrum has been proven time and time again in side-by-side tests to achieve equal or better results than HID with 40% less power and 50% of the heat. We don’t believe in continuing the tradition of “white” or “purple” LED grow lights. Other “full spectrum” LEDs leave out important colors, or try to achieve a spectrum that sips the least power on paper. What they neglect is that plants sense a wide range of colors in their environment to achieve their greatest potential. 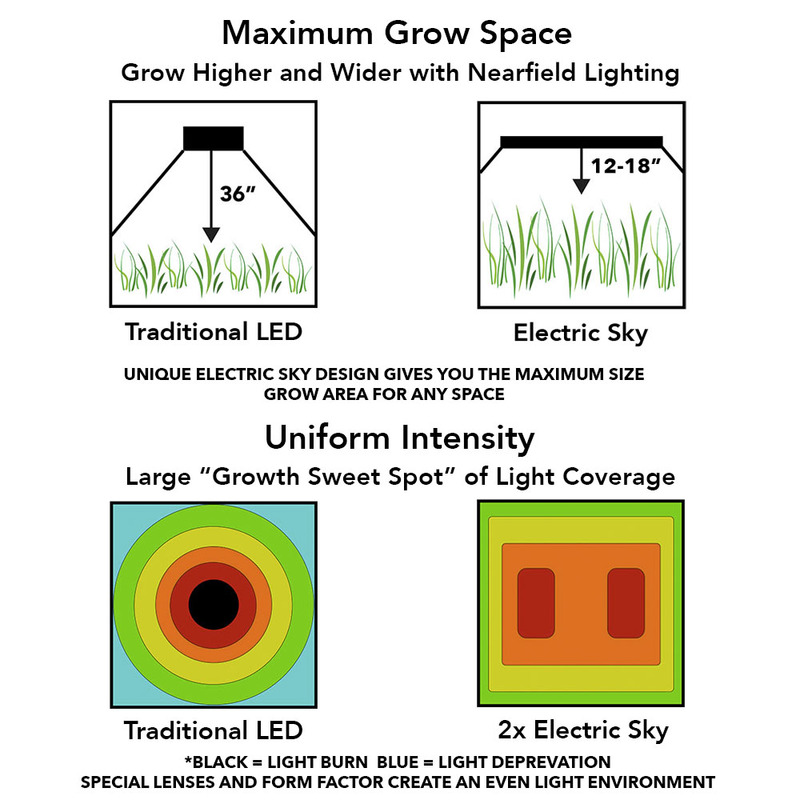 The wideband spectrum used in the Electric Sky replicates some of the Sun’s infrared wavelengths for growth power, with a balanced color ratio to instruct plants to grow in a shape that maximizes yield. The growth powered by Electric Sky will “wow” you and put fun into your indoor garden. You’ll see as your plants respond quickly to the single spectrum from seed through flower. There’s no need to confuse your plants by switching spectrums or swapping bulbs between veg and flower with the Electric Sky. Its spectrum is designed for maximum results in all stages of growth. Many of our growers report accelerated growth and improved plant response just days after replacing their old lighting with the Electric Sky in their gardens. Why waste light sending it to places where it isn’t used by your plants? When growing with the Electric Sky, its linear lenses make directing light an easy task. They focus brightness away from your eyes and onto your plants with just enough intensity and power. It spreads light in a “rectangular” projection pattern that’s a snug fit to any grow area. You’ll want one light for a rectangular grow area, and two lights for an equal square. If you’re looking for the best full spectrum LED grow light, using the Electric Sky 300 is like putting your entire crop on steroids! Thousands of growers all over the world trust Electric Sky LEDs to power their garden. Are you next? SAFE, WORRY FREE, AND EASY TO USE: No hot bulbs to deal with, just plug in and grow! 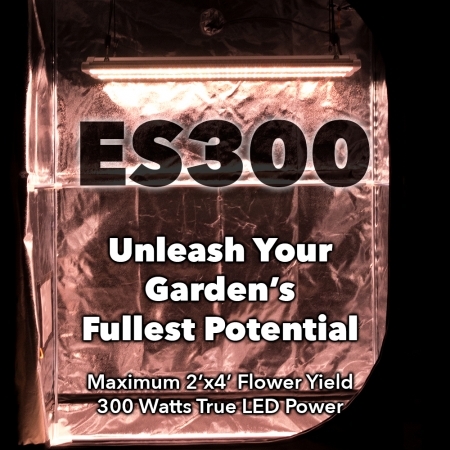 The ES300 is designed to produce an intense but inviting light environment for your plants. 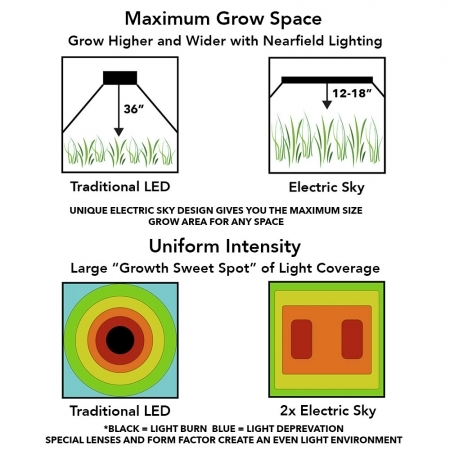 Instead of light splashing into your eyes like other grow systems, the Electric Sky directs light downwards and towards your plants, increasing efficiency and light intensity. GIVE YOUR PLANTS THE CORRECT LIGHT INFORMATION: When plants don’t have enough infrared light, they’re “flying blind”. Other “white” or “purple” LEDs fail to provide plants with enough usable near-infrared light. The ES300 gives concentrated red & IR flower power that accelerates vegetative growth speed and encourages heavy flower weight. 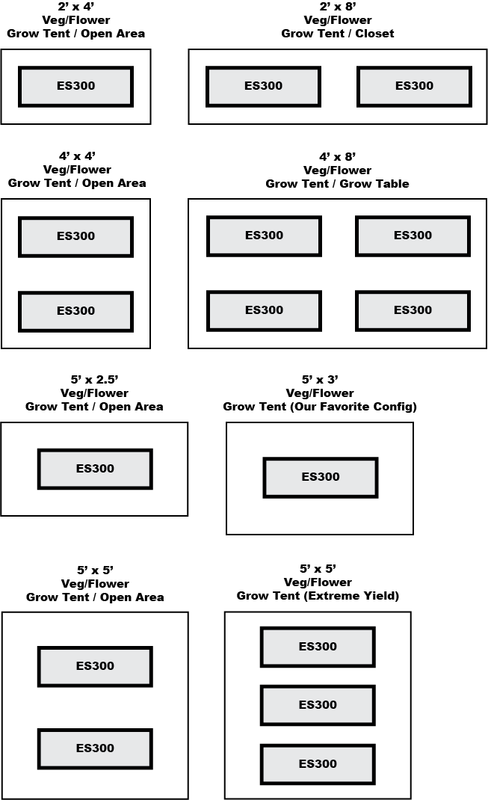 ADJUSTABLE, MODULAR SYSTEM: Each ES300 panel creates a SKY to flower a 2’x4′ area up to a 3’x5’ grow tent. 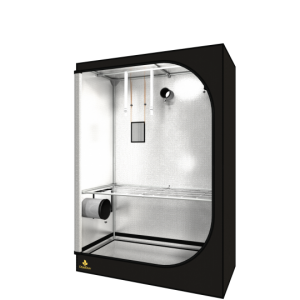 More than one expands the rectangular footprint to a square, giving you the option to angle and adjust each unit to evenly illuminate your plant canopy as it grows. GET YIELDS EDGE-TO-EDGE & NO HOTSPOTS: Distributed LEDs and special linear lenses shine light all the way into the far corners of your garden, keeping your entire garden brighter. ACHIEVE TOP-TO-BOTTOM FULL PLANT DEVELOPMENT: Electric Sky activates growth beneath the canopy with penetrating spectrum colors so you can harvest more usable product from the top to bottom of your plant. SILENT, PASSIVE COOLING: No moving parts to make noise or break down the road. 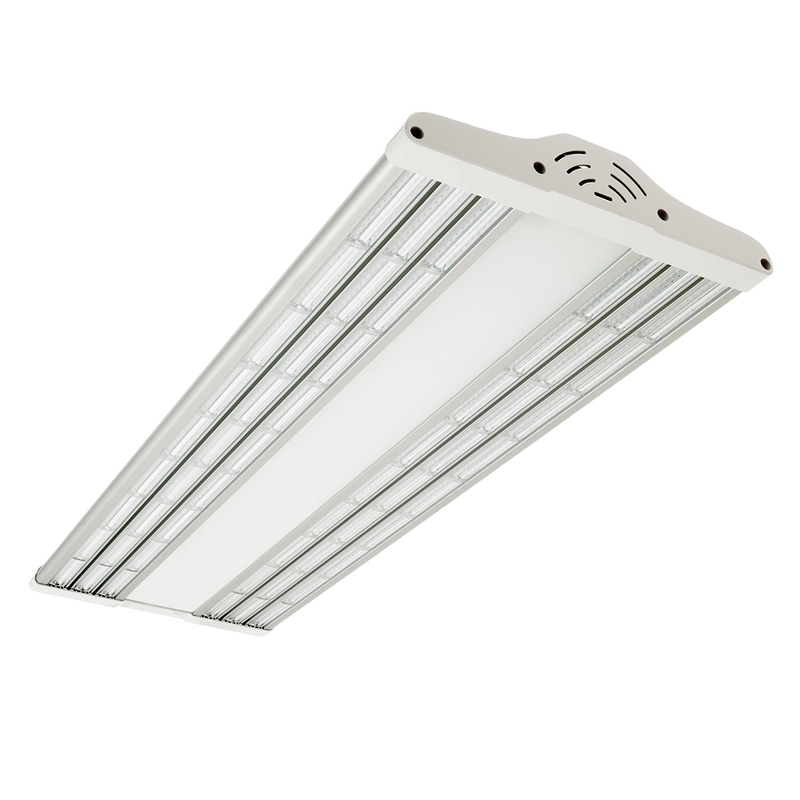 Uses only 300 watts of energy for 500 watts of HID growing power with half the heat! Imagine where you’ll be in 5 years after dozens of grows under your belt. Will you be satisfied with your grow setup or will you be wondering if you should have given yourself an upgrade? The best part is that you are 100% safe to try this out for 90 days at home to see if it works for you. If it does, you’ll be delighted with the results. If for some reason you’re not completely satisfied with the growth and plant response, then you can let us know – and you get all your money back. What Does the Future of Your Garden Look Like? If you’re still reading this, you may be eyeing the purple hue in your grow tent, feeling the heat from your HID bulb setup, or are considering starting with one of these two options, but you know there’s a better option out there. 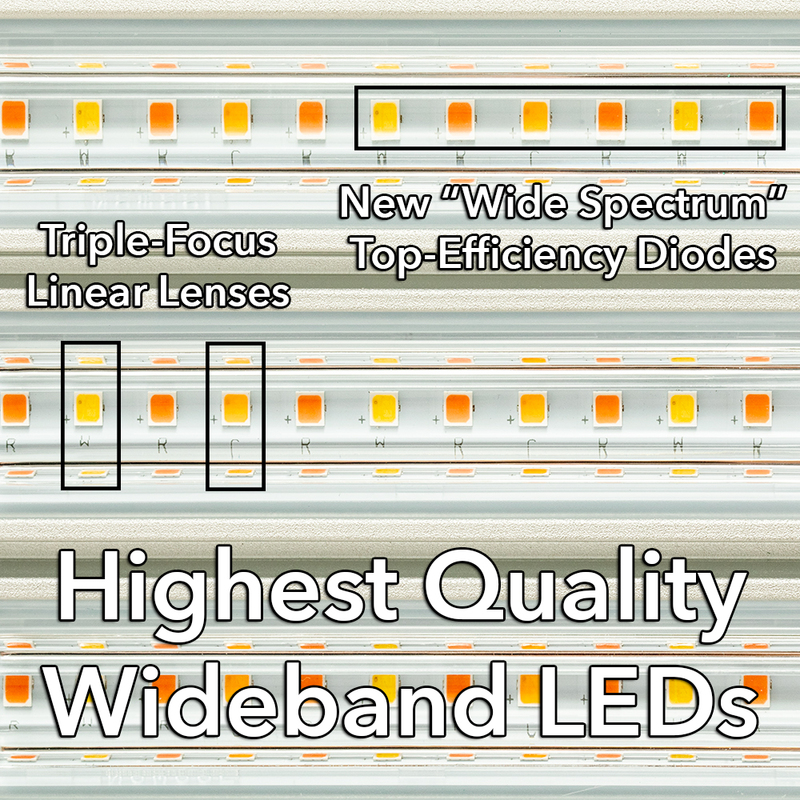 Here’s the tough truth you probably already know — lower end LED lighting will cost less up front, but isn’t going to produce the results you truly desire, meaning you’ll have to spend even more money for an upgrade down the road. Traditional HPS or MH bulbs will make growing a challenge with the heat, bulb replacements and expensive power bills every month. Electric Sky 300 contains LEDs that last 50,000+ hours for over a decade of growing, so you can concentrate on caring for your plants, not on maintaining or upgrading your lighting system. Now, it’s up to you to choose the solution that will last, regret-free for years to come. What will you choose for yourself and your garden today? Internationally compatible plug for 100V-270V use. 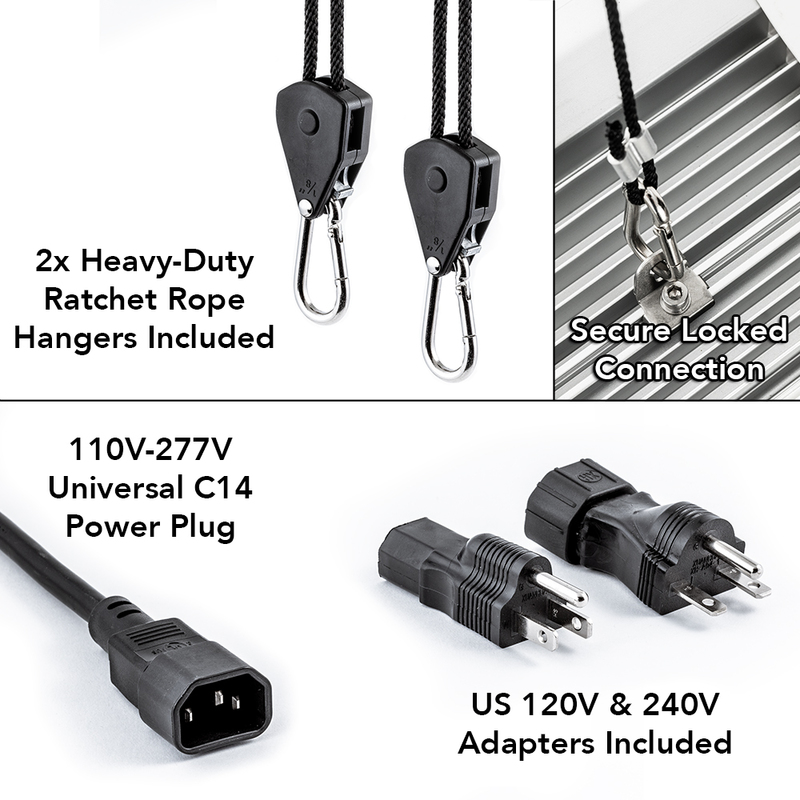 Search “C13 Power Cord” for an adapter that fits your country. * Wideband spectra like the one found in the Electric Sky are more efficient for plant growth per photon due to the Emerson Effect. 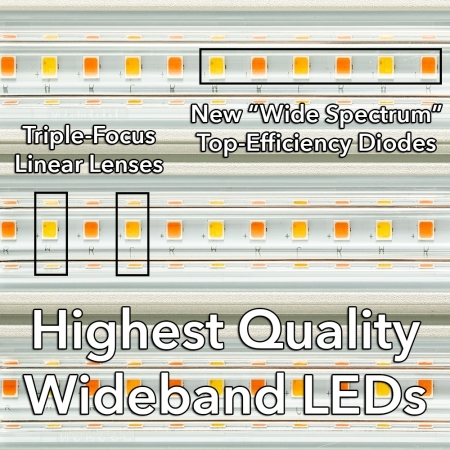 ** Wideband diodes create near red and infrared light above 680nm, critical nutrients to plant growth, at a slightly lower “electrical efficiency”, but greater overall “plant efficiency”. The Electric Sky 300 projects light in a rectangular footprint with its linear lenses. 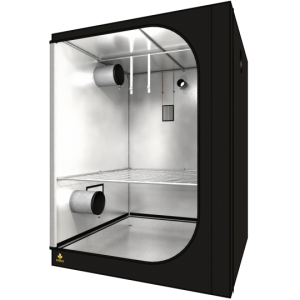 The modular design will allow you to scale multiple ES300 units to evenly illuminate your grow area. Contact Us if you would like a custom grow area design. Ten days into flowering and my plants look great! Fan leaves are a deep, dark green and not much stretch. My space is so much cooler as well. I am blown away by the ES300, plants look better than expected and with all the money I’m saving on energy and bulbs I won’t be going back to HPS/MH! I heard about the electric sky from a friend. Super stoked now that I wen’t though a full indoor crop with the es 300. My Plants produced big time. Done with bulbs, this is the way to go. Just the energy savings is enough to get my attention, but I did not expect this! Slowly switching my whole set up. Just got my lights in the mail. Fast shipping. I can’t wait to get these pups up. Thanks Dan for all the help. I am so happy I made the choice to purchase the electric sky. From veg to flowering, I would say there is no comparison to anything I have ever tried in the past. I have been growing 15 years, and wish this came out when I first started. Life would have been much easier. I installed two ES300s in my 4×4 grow tent two weeks ago replacing a 600w MH lamp, making the change as I switched from veg to flower. The results are incredible: all my plants are already producing visible buds, which appeared after only a few days under the ES300s, and growth accelerated visibly, adding up to a couple inches a day (or even during the dark period!) The amount of plant matter has been accelerating as well. Light penetration under the canopy is excellent as well, there are no longer yellowing or dropping leaves even towards the bottom of the canopy. I do understand Dan’s caution that these lights are not for beginners: the plants may outgrow the space and will require more and careful pruning in future cycles to retain control and maximize production because of the fast growth – I’ve had to brush up on my pruning skills. Also, I’ve been able to reduce exhaust fan speed for tent ventilation because there is less radiated heat from these lamps, allowing the grow space to be at a higher temperature – which also means faster growth. But it can also mean higher humidity so watch out for that. Right now I’m running at 80 degrees and 45% humidity with my ventilation fan on the lowest setting and two circulation fans: one above the lamps to prevent stratification of heat near the top of the tent, and one near the floor to move the air through the canopy. I did not experience an overall reduction in heat production but that was because I chose a configuration that gave me more light than the MH for the same amount of watts into the tent, and the total watts is what determines heat production. I have the 2 of the ES300 the growth and buds just explode under the lights. Must buy!!!!! The best light you can have in 2018! Fast growth, green leaves, healthy plants, little electricity consumption… I am 100% satisfied! Thanks for everything Dan! I have wasted a lot of money on LEDs in the past couple years and was never satisfied! Until I got my hands on the ES300. This LED is like having a small SUN in my grow room. Amazing growth, huge… huge buds! Thanks Dan for getting yourself in the LED market. This is an update to my previous review. I just completed my first grow with two ES300s in a 4×4 tent. The harvest was amazing – about 20 quart mason jars, not to mention a lot of undergrowth to produce a few pounds of bud-containing trim for edibles. It seemed to produce about twice the totay usable flower weight of the 600w CMH lamp I had before. However, the light’s amazing growth stimulation also caused my tent to become a bramble and my harvest was a small fraction of the total weight of growth – something I never had to deal with before. So next time, I’m going to use a dual-level SCROG approach to keep the light on the flowers, and avoid producing a lot of trim. Also because of the rapid growth I got taken by surprise on water usage and ended up with some fertilizer burn because the growth medium dried out so fast that the effective fertilizer concentration was too high. The solution would be to water more often of course but I didn’t realize it at first. Or to switch to hydro, which I’m doing on my next grow. I also noticed that the plants produced different looking bud than under the CMH: more richly colored and heavier. This meant more staking and binding had to happen. But it’s a great thing. These lights produced just enough heat to keep my tent at 80 degrees on the low fan setting which was perfect, but I had to watch the humidity more as a result. The fact that they’re dimmable means you can use the same tent for vegging if you wish and the lights cause really fast vegetative growth which of course is great. Overall I’m very satisfied – including with Green Sunshine’s support which helped with getting a faster understanding of the differences from CMH. I was skeptical about purchasing these lights since everyone claims that their lights are the best on the market. I got two ES 300’s in a 4×4. All skepticisms were put to rest as the weeks passed. The growth rates are ridiculous! I damn near grew myself right out of the tent! Light coverage is perfect. Gonna get a 5×5 next. These ES300’s will definitely be able to handle it. Es300 killin it in the garden! Will definitly b buying another! This is a real deal led grow light. I’m testing a ES300s right now. Early on in the grow but my vegetation is growing very quickly and my cannabis plants look fantastic. Can’t wait to see what this baby does with flowering. 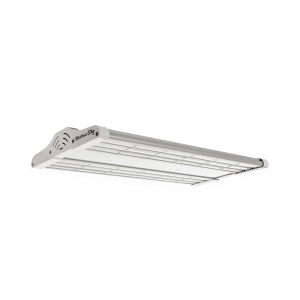 This grow light unit is a massive jump ahead of the competition. The unit is made of high quality materials and doesn’t require fans to cool the unit. Fantastic! I love my two ES180’s so much I am saving up for a couple of these too. Dreams. Wow is all I can say for these lights. I Did a lot of looking around before I decided to go with these ones and I am more then happy with the results. I would highly recommend these over almost any other led light, the foot print is great and the power is amazing just one ES300 absolutely blew my 600w hps out the water in every aspect. Amazing lights all round simple as that. Absolutely hands down the best LED grow light on the market. I’m 1 month into flower and the first 2 weeks my plants tripled in height and are now starting to stack on some major weight. 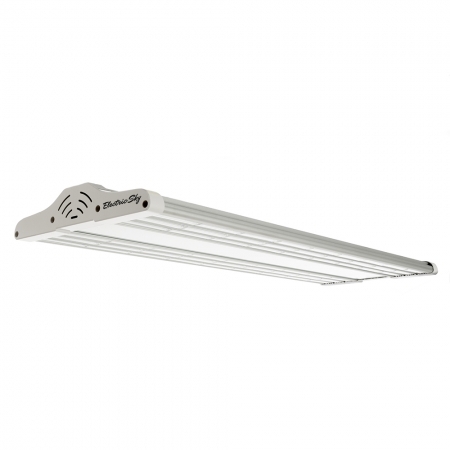 If you’re on the fence about buying this light look no further, the price of the ES300 is a little scary at first but you get what you pay for – a superior LED grow light above the rest. Not only that, but Dan is extremely helpful and knowledgable about the science behind his light, and why it’s so much better than the rest. I will be a customer for life, keep up the good work Dan! Had a friend tell me about these lights. I was skeptical at first. Came time for me to get a new light and I did some reading and watching videos. I decided I would give the 300 a chance. I am halfway through my first test run and so far all of my garden is exploding. This is the best LED light I have had so far. The growth is double what I have had in the past, I like the air cooled setup. It does give off a good bit of heat but nothing you can’t over come. Two 300 in a 4×4 tent is exactly what you want. You can easily angle the light for your need. I just harvested and it produced 115 grams( in 70 days from seed), my previous best w/ this batch of seeds was 49 grams w/ a advanced spectrum max 450. Not even the whole grow was under the es300 and I more then doubled my harvest! Ive only had these lights for about 2 months and the flower production is great. By far the best light ive ever ran with thank you dan. Will be ordering more! Came in less then a month ago and i couldnt be happier explosive growth rate plant loves it and so do I take your garden to the next level thanks greensunshine co. I have had a pair of the 300’s for 30 days, I now have 4 very large girls ready to go to flower. This is my 1st indoor grow and so far they react and act just like they were outside! That is honestly the biggest compliment I can give. I will be buying more ASAP to increase my room size. These are simply an efficient to run, cool in the room, and require no additional A/C. I am a total believer and so are my non LED growing friends. First, the lights are flat out killing it. I had a bit of a learning curve with regards to light height vs my 630 LEC, and surprisingly, drastically increased watering schedules. I think I’ve got that all dialed in now and things are progressing very well. – 1xES300 did all of the veg work for me, awesome that I had half the electric consumption with the amazing results vs 630 LEC. Once again, I grow exclusively in super soil, 7 gallon fabric pots, from seed and in tents. I run 2-3 brewed teas during this time and typically foliar feed with Heavy16 once every 7-10 days. – Drastically quicker water consumption vs. 630 LEC. .5-.66 gallons every other day vs. .5-.66 every 4th day. 2x water consumption with 1/2 the watts. Topped at day 28 from seed – this is my typical timing which usually hits around node 5-7, with 1 ES300, I ended up topping at node 9!!! – I like to grow a robust plant before switching to flower…usually around day 60 from seed. With just 1 x ES300, I switched to flower on day 46, a full 2 weeks sooner with 3 more nodes of development. Simply amazing! – Flowers have developed at a much quicker rate. I am seeing trichome production already!! More uniform development down the stalk (I lollipop to the last 5 bud sites on each stem), with significantly sturdier/more rigid stems. – There is already a fairly strong aroma. Of course the carbon filter scrubs it, but as soon as I crack the tent open it’s close to overpowering already. – Incredible growth rate. I love this. The plant is just exploding!!! – Stretch was slightly shorter in duration and distance. Usually these stretch for a solid 2 weeks and then slow down the 3rd week. This time they were done at the end of week 2 and stayed slightly more compact (I would estimate 15-20%). I am up and running with my ES300. It appears to be very good quality unlike all the other lights I have. I particularly like the footprint it provides. A much longer PAR area. I have a 5’x 3′ tent and it is perfect. I may add the ES180 later. My harvest is nearly in as well, and it’s one of the best crops I’ve had in the 5 years I’ve been working this 4 X 4 closet grow. The 1200 watts of Chinese LED lights I had hanging previously were shown up pretty badly by a mere 600 watts of Electric Sky. By far the most healthy I’ve ever seen my plants look. Obviously the reason they had 0 problems through the entire grow. They were just feeling too good to stop dancing for anything. There’s going to be a lot better yield as well, due to the amazing light penetration. I also see the trichomes are ripening with unprecedented uniformity, that’s going to make harvest a breeze, no taking buds a level at a time to even out the ripen. I’m really glad I met Dan and The Green Sunshine Co, their lights have taken my grow to the next level. Thanks for sticking your neck out and getting these lights on the market, they are undoubtedly going to make a lot more growers very happy. Initially I starting using the ES 300 during veg and the plants were initially shocked by the “different “type of light. However after an email back to Dan , and hus advice my plsnts are loving these lights ( I bought two ES 300 ) and I am very pleased with the results . The bud sites that this light creates leads to much larger harvests. I’m happy with the purchase these lights PERFORM ! As many of us, my home growing journey started with a cheap 600W LED grow light (later figured out that it was only drawing 40W at the wall). Plants were sluggish and did not seem to be very happy, time to do some research. I stumbled on a YouTube channel featuring the ES-300 and that was it for me, 7 days time-lapse showing the plan growing by a third in volume, I wanted in. Slowly ramped-up the wattage to not shock my plants, a couple of weeks in, my 3 plants are overflowing my 3×3 tent… I ordered a 4×4 tent, and another ES-300, now this is my 4×4 that is overflowing, with huge colas forming 3 weeks in flowering. I have ordered a third one since and it is probably not the last one. Do your plants a favor and get this, you will not regret it. I purchased one of the ES300 lights and it has by far exceeded my expectations. So much so that I had to purchase another one great job guys! Fat buds and explosive veg growth with excellent trichome production. I have just recieved my es300. First impression, well packed for delivery. Came in one piece. I am mechanically inclined so i really dont need the directions but they make it so user friendly. When looking at pictures online or videos it dosent do this light justice. Its defenitly bright great tent coverage and it has some weight to it but not hard to work with. Fits in my 2×4 but now I wish I bought a 4×4. I am glad they were out of stock of the es180. I wanted to use it for a filler but i will be using the es300 as my main light. I called to get my blackfriday promo code. They were closed at the time but before I can wait till they opened again a gentleman called me it was a little hard to hear at first but he definitely could hear me and fixed the phone situation. He heard my questions answered them with great knowledge and that made me want to buy this product even more knowing there are people with integrity witch is hard to find these days. One last thanks goes to Matt Canuck from Canucks grow. Without him I would have never known about this light. I was looking into 2 other brands witch ive researched for a while. 1 brand I will still get because I have another small area 3×3 and its newer technology just like this one. But the truth is for 300 w this thing is perfect for my bills, temp and its just like everyone says its perfect . If your a person thats indecisive like myself watch several videos, reviews, compare data ect ect. This is the light for you. 100 percent satisfied from first impression. FYI i own 5 lights now between $350- $1250 I like this the best. The real test will be an update review in about 3 4 months. But sometimes you just know. Thats how this light makes you feel. The ES 300 LEDs are impressive and they surpassed my expectations. These LEDs are well crafted, built with high quality material, and are beautiful; plus, they are certainly worth the listed price. Plants respond really well to them too; my plants absolutely love them and I’ve never seen them happier. You definitely get what you’re paying for. I was most impressed with my first harvest. I honestly wish I purchased them sooner. So far, I prefer them over my HID lights, and I’m planning to replace all my HID lights with these LED’s in the near future. These lights are perfect for tents, and in my opinion the better option. Moreover, The Green Sunshine Company has excellent customer service, and they respond promptly to any questions or concerns. It’s been a pleasure doing business with them. 5 weeks into an auto flower grow of Lamb’s Breath. Man, this light is killing it at only 300W (ES 300) in a 2×4 ft. tent with 4 plants. I started with the light hung at 36″ high (seedlings) and gradually moved down to 20″ (currently in first week flower). I love the fact there are no fans to fail. The light is a solid extruded aluminium heat sink! The time proven technology that helps cool your motorcycle. These lights run cool, with some air circulation you already SHOULD have in your tent. The light is directed right at your plants, not wasted on the walls, and so far my lower buds are stacking up well! This is looking to be a great investment in my growroom. I highly recommend the ES300 to all my fellow growers. Also, fast shipping in descrete packaging. Awesome service and glad I decided to go with this company for an upgrade. My plants are loving it! Thank you green sunshine for developing an amazing light! Wow!!! I have spent thousands on led’s in past few years some commercial grade and none impressed me like the ES300!! First off I can see planst in true colors!! Plants bushed out and all leaves down the canopy happy happy happy!Thot price wus a bit high but you get wut you pay for and will buy a few more with no hesitation!! Thx Dan for your help and awsome job @ shipping!!! Hands down best light I’ve ever used, powerful sleek silent and yet a joy to work under with out blinding me or hurting my eyes. Flower production top shelf and fast strong vegetative growth. I plan to pick up the 180 for a smaller space very soon. I purchased the ES 300 LED after reviewing about 20 lighting systems. I am a newby at my first grow. After hearing so many people complain about the lighting system they purchased, and then watching them scramble to find a better lighting source, I am beyond happy that I spent maybe a few dollars more for a quality light. There are so many things that can go wrong when trying to start your first grow. It has been really nice to not have to worry about a good light source for my plants. From what I have seen so far, my plants are far ahead in growth and health, than what others have experienced. Will definitely be buying more lights from Dan for my next grow. The ES 300 works as advertised and I was not expecting anything less given the fact that there is a 90 day 100% unconditional money back guarantee and three year warranty. For myself, customer service is what it is all about and I certainly have not been disappointed in that department ( Thanks Dan). As for the lights it is one of those things you would not believe unless you try them out for yourself, simply amazing!!!!! Plants reach out to these lights more so than many other types of grow lights and the resulting fast growth is phenomenal. The lights may seem a little pricey compared to other less efficient purple lights but what you have to ask yourself is do I want a mediocre or excellent grow given all the time and effort and money you will be putting into your grow? I definitely will be purchasing more lights in the the future. One of the biggest yields I’ve ever had! The real deal! ES300 is by far the best and easiest light I’ve ever used. There’s a noticable difference in every aspect from even area coverage to rapid foliar growth and even environment control compared to other lighting options out there. Not only that, but every question is answered promptly and thoroughly by Dan himself. With a money back guarantee, you have nothing to lose but try them for yourself. Very efficient light. Crafted with detail. I’m able to keep the temp low, and also keep the light a foot away and still have my canapoy praying with no stress, in veg. I will post another review upon flowering but I definitely recommend this light for cultivation of any kind. Replaced 3 cheap Chinese led’s with an ES300 , was so impressed with the rapid growth in one week I ordered a second light right away. Now on my second grow with the 2 ES300’s and my 5×5 area is well past double the yield from the cheap led’s I had before and i still have a few weeks to go! So happy and plan to buy more. I’ve been through other led lights and never was satisfied with my bud density or size. This light has changed that and my plants will never be under any other light again. Added an es300 to my 2 Viparspectra 450w. All i can say is wow! the 1 es300 makes it look like the vipars aren’t even there. Ordering a second ES300 to replace them to cover my 4×4 area. And the customer service… All i can say is… INCREDIBLE! Emails/questions answered in record time and Dan takes the time to properly educate you to achieve the best possible results! I have been very hesitant in purchasing an LED grow light. 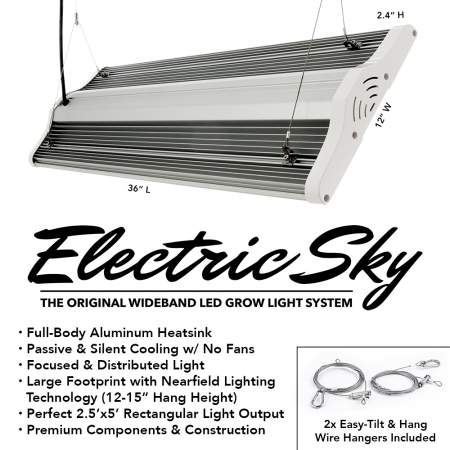 After studying up on the many different LED grow lights I came across the Electric Sky ES300. Since it had a 90 day back guarantee how could you go wrong. All I can say is wow, glad I did. The Flowers are growing faster and the buds are dense and fat. Also customer service is a big part of my large purchases and hands down it is at the top. Dan, thank you for steering me towards the ES300. Great light, good price and excellent results so far. When I started growing I was using a blurple led in a 2×2, later added a small 150hps when I got a 4×4 tent. Didn’t take too long for me to itch for an upgrade. After a lot of shopping around and reading reviews I was still on the fence. I was convinced to contact Dan, and man, I am happy I did. I haven’t finished a full cycle under it yet but this ES300 is growing my biggest plant to date. Thank you Dan for your excellent work and service! I have 1 es180 and two es300 and I do not regret investing In these lights at all! My plants love them and I love watching them grow so happy and healthy! These are some badass lights all around! I will be investing in two more es300 in the near future as well! One of the best investments I’ve ever made. I bought two ES300’s for my 3ft x 3ft grow tent. I had them shipped to the UK and was a little concerned about customs charges & VAT, but was pleasantly surprised when they arrived these charges were not as expensive as I thought (around £240). I started using one of the ES300’s straight away on a plant that had already started flowering under a budget Mars Hydro light and the results were amazing. I’m so glad I opted for this grow light rather than a more expensive fixture. Top marks to Dan for the great customer service. Nothing less than AMAZING! I’m using two of the ES300’s in my 4×4 tent. I’m 100% satisfied with these lights, not only with the end result which doubled my yield, but the quality of these lights. The housing alone for the lights are amazingly built, there were no corners cut when designing them. When sent to you, they even set you up for different options of hanging these lights. They were also packaged very well for shipping to prevent any damage from the currier. I do plan to be a returning customer, maybe I’ll pick up the 180 for my 2×4 that I clone in. I would recommend these lights to anyone and everyone! Wasn’t sure about led’s,but I’m glad I chose the ES 300, cause it’s Effing awesome…. I bought an es300 a couple months ago and I am defiantly going to buy two more. My plants love the light spectrum. Even on the lowest power the plants respond. The customer service is amazing as well. Returned my calls very quickly and answer all my questions completely. I highly recommend this light for any type of indoor grow. Ive been dreaming of growing with the ES300 for a long time now and finally set aside the money to purchase one. The light arrived just in to time switch my LED garden over to flower, I had 2 other brands in my tent (a 900w and a 600w). This fixture far outperformed the others. I have the ES300 running solo now with a few plants underneath of it and will be purchasing another as soon as I am able to. I will update this review after a few weeks in veg to let you know how its going!